Clinical trials in Cambridge are coordinated by the Cambridge Cancer Trials Centre (CCTC). The CCTC is a collaboration of Cancer Research UK, the University of Cambridge and Cambridge University Hospitals (CUH). The Early Phase Clinical Trials Team (EPCTT) was established in 2008 to focus on early phase trials and experimental medicine for priority cancers for the Anglia region. Both the CCTC and the EPCTT aim to translate the latest scientific breakthroughs in the laboratory into clinical practice to improve patient outcomes for the prevention, detection and treatment of cancer. The breadth of clinical research is extensive spanning both early and late phase studies. The CCTC team of around 100 clinical staff, researchers and administrators manages a portfolio of over 250 clinical trials, including around 120 open to recruitment, to test new ways of detecting and treating a wide range of cancers. For more information about the CCTC and clinical trials. The Cambridge Early Phase Clinical Trials Team (CEPCTT) was established with the appointment of Professor Duncan Jodrell as chair of Experimental Cancer Therapeutics in 2008. The team underwent significant expansion in 2011 with the appointment of three further, full time University Academic Consultant Medical Oncology Physicians (Dr Bristi Basu, Dr Richard Baird and Dr Simon Pacey). The team works closely with clinical translational scientists across the Centre with specific expertise in breast, oesophageal, pancreatic, prostate and ovarian cancers, as well haematological malignancies. The current team comprises 17 staff and we work closely with colleagues from the Addenbrooke's Clinical Research Centre, which includes a dedicated day ward and inpatient beds providing our patients with access to state of the art 24/7 research facilities. We have a trial portfolio of 18 studies open at present, prioritising investigator led studies but including several collaborative projects with biotechnology and pharmaceutical companies. The close links developed by the EPCTT with clinical translational colleagues mean that Cambridge is able to offer a significant advantage when planned studies synergise with local research interests. We have experience in delivering trials of both small and large molecules across a broad range of oncology targets, including first-in-class or first-in-man studies. Monitoring molecular changes with functional imaging Molecular imaging approaches are incorporated into many of our trials. In addition to accepted techniques, we can evaluate novel PET techniques; dynamic 18F-MISO (hypoxia) and 15O-water (perfusion), MR approaches; magnetisation transfer (stromal assessment in PDAC) and EUS (elastography) as tools in experimental cancer therapeutics. We will participate in clinical studies required to evaluate hyperpolarised 13C-pyruvate and 13C-fumarate, work funded by the Wellcome Trust and Cancer Research UK, building on the pre-clinical work in the CRUK Cambridge Institute. This technique allows the real time detection of pyruvate to lactate and fumarate to malate flux. Initially pyruvate will be evaluated – as an early marker of treatment response, and subsequently fumarate – as a marker of necrosis. Initially, following a first-in-man study, these will be applied in three clinical scenarios: lymphoma, glioma and breast cancer. Addenbrooke’s will be the second site in the world to use 13C-pyruvate in patients and the 13C-fumarate study will be a first-in-man study. The ability to detect and monitor cancer mutations using circulating tumour DNA (ctDNA) derived from plasma has been pioneered by scientists at Cambridge. This test is being implemented under good laboratory practice (GLP) conditions that will provide a rapid and sensitive test for early response, as well as to monitor tumour heterogeneity, both before and during treatment. Next generation sequencing will be carried out in the new Cancer Molecular Diagnostics Laboratory to GLP standards equivalent to a Clinical Laboratory Improvements Amendments (CLIA) approved laboratory setting. Molecular characterization of patients referred to the Early Phase team will be carried out in order to both define the population and to enrich specific populations in clinical trials. The phase I study of MK-0752 with gemcitabine utilises a novel design for a combination phase I/II trial. Strong links have been made between the EPCTT and the MRC Clinical Trials Hub in Cambridge and our ideas regarding combinations studies have developed further. Future combination phase I studies will include such novel designs and an adaptive, biomarker directed study (SMARTer) is planned in patients with breast cancer receiving neo-adjuvant therapy. The Early Phase Clinical Trial Team is working closely with the MRC Biostatistics Unit to develop approaches for combination and adaptive trial designs. These are being carried out based on novel biomarkers and tumour monitoring using imaging and circulating tumour DNA (ctDNA). These strengths in functional genomics and imaging provide a unique resource for investigating approaches for personalised cancer medicine. 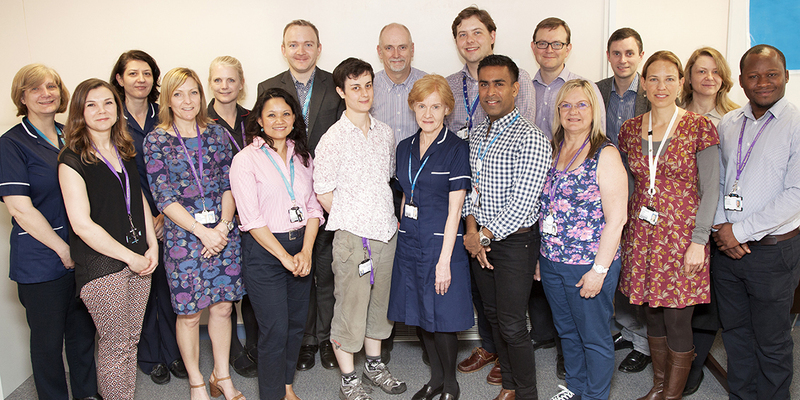 The Early Phase Clinical Trials Team has 18 ongoing studies and accepts up to 5 patient referrals each week. Please download the EPCTT newsletter for the latest news on current early phase trials in the Cambridge region.